I put off reading this book because of the reviews. 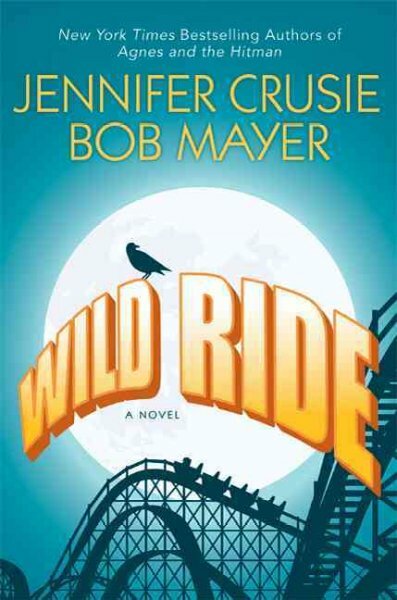 Everyone who has read Wild Ride (and then posted about it at least) seemed to greatly dislike it (or worse). So I put off reading it until I read a good description of the book... theme park, ambulatory clowns (shudder), ex-military guy with a chip on his shoulder and bullet in his heart (a must when Crusie and Mayer team up, right? ), and... wait for it... demons. Being held as prisoners in an amusement park. No Joke. This is the setup for the book. I had to read it. The most important thing to remember when reading Wild Ride: It. Is. Not. A. Romance. Novel. Yes there’s romance, but no more than you would find in a Ken Follett novel. Seriously. Lie Down with Lions had way more romance, if not the potential for a happy ending (and yet, somehow Ellis remains my romantic non-vampire ideal fictional man). So, got that into your head? This is an action/adventure-y novel, with a good hefty amount of fantasy thrown in. Not a romance. Period. Now that that’s out of the way, I really enjoyed this book. Maybe it’s the fact that I have never been overly fond of amusement parks, even less of the traditional carnival verity due to the possibility of clowns but reading about Dreamland from the viewpoint of someone deeply in love with the park and helping to restore it and give it life kind of gave me warm fuzzies. What didn’t give me warm fuzzies, being told this was a romance and then finding out the hero and heroine are brother and sister... un huh. Not fuzzy at all, kind of a splash of cold water, leaves the reader floundering around trying to figure out what the crap the author has planned (probably the reason for at least some of the angry reviews). Of course, this being a standard non-genre novel allows both the hero and heroine to be introduced at the same time without them being meant for each other. See my point above, and someone please tell Crusie’s agent that yes, books can be marketed in different genres. Fans appreciate honesty in advertising. There was so much going on in this book at times I quite literally lost the plot, but it wasn’t an uncomfortable flipping back to re-read lost, it was a “let’s see where this goes” lost. Oliver, known as coke-bottle glasses guy for most of the book was my favorite character from the first time Mab sees him, and I have no idea why. Sadly the book has already gone back to the library or I would flip back through to see if there was any foreshadowing to why I should have liked Oliver back when he was just some guy in a bar or at the Dream Cream. Maybe I just liked the weirdo, who knows. I loved the Demon brigade; the five untouchable demons imprisoned in Dreamland are hilarious. From Kharos (the worst of the worst, aka “the Devil”) using the excuse “well look at her, she’s hot” for cheating on his demon mate, to Vanth, who only wants to love the souls being sent to hell, they are all characters in their own rights and only add to the ambiance and flow of the story. The Special Forces people in the story, because as I said, what Crusie/Mayer collaboration is complete without Special Forces people of some sort, are a tad bit annoying. It could be their gung-ho attitudes that repel me, but before the stuffed velvet dragon I could not stand Weaver. Though part of this also comes back to (to beat a dead horse... or romance) the idea of Mab and Ethan being “the” couple of the book, and Weaver, as Ethan’s love interest messing that up (not to mention the whole revelation of them being brother and sister). Either that or I just didn’t like her attitude before Beamer (the aforementioned dragon), it could go either way. So, read it, don’t read it. Look for adventure and fun and you’ll find it, just don’t look for a formula romance, because it’s not there.